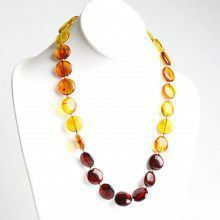 This beautiful 100% Natural Amber Pebbles Necklace is comprised of multi colors amber stones, which were tumble-polished by the Baltic Sea in Russia. The stones gradually range in size from about 3/8" to 1 1/4", which are individually knotted allowing you to see more of each pebble. Each strand is hand strung so there are no two alike. Here we show one of the strands to generalize the presentation of these necklaces. 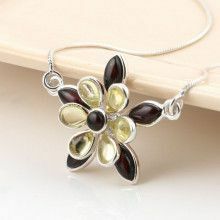 The others will have different amber stone selection in shape, color, and size. The necklace has a natural, modest beauty to it, perfect for any occasion and/or outfit. Stones Measure from 3/8" to 1 1/4"